Those fans play an important role in a new documentary brought to you by MusicScreen, titled "Day Of The Gusano". The 90-minute documentary is to be premiered in more than a thousand screens across the world as a one-night-only cinematic spectacle on September 6. Directed by SLIPKNOT's own M. Shawn Crahan, a.k.a. Clown, "Day Of The Gusano" documents the Iowa band's first-ever visit to Mexico in December 2015 and features exclusive interviews with SLIPKNOT's members talking about the importance of their fanbase and the band's long-awaited first-ever show in Mexico City. Confirmed cities and ticketing for the screenings will be announced in July. Talking about the movie, Clown says: "SLIPKNOT still has dreams for itself. Finally playing Mexico was one of them. It's been a surreal life of rock and roll for SLIPKNOT and the fact that the dreams still go on for us is simply incredible. Thank you." Guitarist Jim Root adds: "We had such a great time at Knotfest Mexico... Not only with all the friends and bands that were there, but with the fans and the crowd we had to document it with. Now we get to share it with the world." 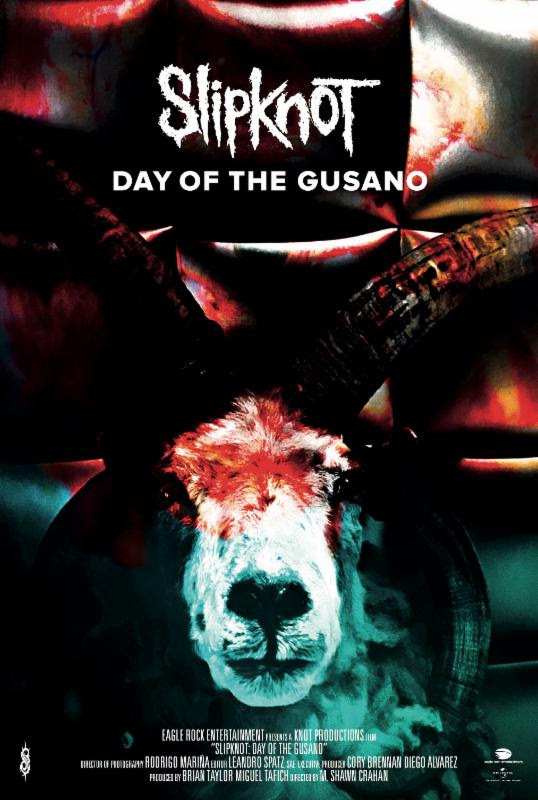 "Day Of The Gusano" also chronicles the rabid devotion of the Mexican maggots and sees the band hearing personal, emotive stories from some of their fans, all interspersed with footage from SLIPKNOT's incendiary live show at the inaugural Knotfest México. The film features a full surround soundtrack, so you'll not only hear the show, but you'll 'feel' it as if you were actually there. To tie in with the movie announcement, SLIPKNOT also launch their #AskSlipknot campaign. Fans are asked to submit their questions to the band on either Facebook or Twitter, using the hashtag, #AskSlipknot, and a selection will be chosen by the band to answer as part of the cinematic screening event. Submit your questions before June 13 in order to be in with a chance of getting your question included. SLIPKNOT frontman Corey Taylor told the 97.1 The Eagle radio station last month that the band was "not really doing anything right now." He explained: "I know we're kind of slowly starting to write some music. Other than that, we're just kind of taking some time off. Clown's gonna direct some movies, Sid's gonna do some stuff… We're all kind of doing our own thing… But that's it. I mean, really. Next year is everybody kind of doing their own thing, and then probably after that, we will slowly but surely start to get together to do some SLIPKNOT stuff."